Ballet Vermont is your local ballet company. We produce Vermont’s beloved summer tradition: The Farm to Ballet Project, and have been featured on Mister Chris & Friends on VermontPBS. 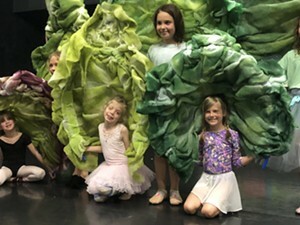 In addition to producing other ballets, we also run kids break camps and summer performance camps! Campers get to learn ballet and do integrated arts projects from members of the company. Our summer campers get to perform on the same grassy stage as the Farm to Ballet Project! Join us this season for all our camps and shows. Visit our website for performance dates and camp details.